Posted on 20. May, 2011 by Corey in All, Atlanta, Dayton Dragons Baseball, General Baseball. It was almost a calendar year ago today that I proudly wrote an article about Enerio Del Rosario, the first player from any of my Dayton Dragons teams to make it to the Major Leagues. He appeared for the Cincinnati Reds before being designated for assignment and being traded to the Houston Astros late in the season. Surprising to me, Del Rosario is still the only Dragon in my three years to appear in a big league game. A handful of players have been added to the 40 man roster by Cincinnati and should appear in Great American Ballpark at some point this year. Not sure if that shows how hard it is to make it to the Major Leagues from A-Ball or how long the process can sometimes take. Last week, the Houston Astros visited Turner Field to take on the Atlanta Braves in a short two game series. Now working in the home clubhouse for the Braves, I was on hand for both of those contests. I was able to venture into the visiting clubhouse before batting practice to spend some time catching up with “Rosie” (what we called Del Rosario) who I had not seen since Spring Training 2010. Del Rosario’s English has improved as he told me he still takes class several days a week. We shared pictures of our families and he showed me his beautiful wife and daughter. 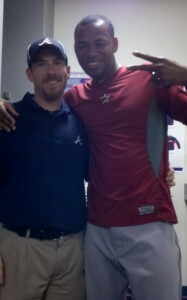 So happy to see a great kid like Rosie having success at the Major League level. Can’t wait to visit with more of my former Dragon friends in the near future.